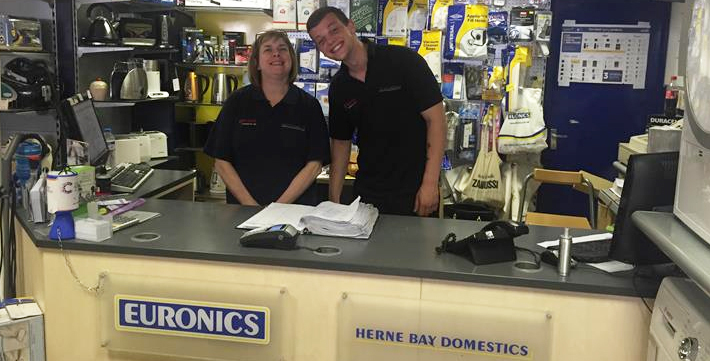 Welcome to Herne Bay Domestics, a local Euronics retailer near Canterbury. We are located on the Herne Bay High Street and have proudly served Canterbury with low prices and unbeatable customer service since we first opened in 1984. We have a great reputation for our dependable customer service and being a Euronics dealer that genuinely cares about their customers. We feel that great customer service is imperative in a time where long waits in call centre queues seem to be the norm. And so our ability to go above and beyond for our customers really sets us apart from our competitors. We have a very knowledgeable team of sales assistants that are always more than happy to help you with any questions or queries you may have on our appliances. Our large 1500 square foot showroom is packed full of top of the range appliances from all the top brands, including: Liebherr, Neff, Samsung, Hotpoint, Siemens, Zanussi, AEG, Beko, Blomberg, Bosch and more. Whether you’re looking to buy a new Washing Machine, Tumble Dryer, Dishwasher, Fridge Freezer, Cooker, Oven or anything else – we have the perfect appliance for you, here at Herne Bay Domestics. Plus all of our appliances come with 100% free delivery throughout Canterbury! Great service from Herne Bay Domestics again. Dishwasher blew up yesterday. Went in yesterday afternoon, new dishwasher supplied, installed and old one removed today. The pipework for the water supply was tricky to say the least. But a positive attitude and a touch of humour and the job was done AND AT A VERY COMPETITIVE PRICE. I cannot recommend them enough. Please support all local businesses. Euronics is the largest buying group in Europe for electrical goods. Having 30 member countries across Europe, and reaching 600 million customers from 11,000 specialist stores, Euronics is a proven success. All members are independent electrical retailers. In the UK these are often family-run businesses which have been established within the local community and on the high street for a number of generations. Being local, these stores care deeply about their reputation, so offer the very best customer service and care. Each store can offer you great prices as well as a highly skilled service. Above all else, your local specialist is always on hand to answer your queries, giving you all the after-sales support you would expect from an independent retailer, because as an Euronics store we deliver, we install but above all we care. If you would like to try out any of our products before you buy, come and visit our electrical shop in Canterbury at: 89 High St, Herne Bay, CT6 5LQ. We have a wide range of electrical appliances and our team are always more than happy to help. So, visit your local Euronics store today, we look forward to seeing you! Herne Bay Domestics is a local Euronics store for Canterbury, Whitstable, Faversham, Margate, Broadstairs, Charing, Littlebourne, Herne Bay, Sandwich, Maidstone, Thanet, Ramsgate, Birchington on Sea, Monkton, Chestfield, Dover, Sittingbourne & more!